The Cultural Resource Group of Louis Berger & Associates, Inc. (LBA), recently conducted an intensive archaeological survey of the Shelly Point Site (31CR53), located on the Marine Corps Auxiliary Landing Field, Bogue (MCALF Bogue), Carteret County, North Carolina. Project objectives were to establish site boundaries, identify cultural affiliation, document the integrity of archaeological deposits, and assess site potential with respect to National Register of Historic Places eligibility. The work was conducted at the request of the Wilmington District, U.S. Army Corps of Engineers with funds administered by the Mobile District. The Shelly Point Site is located on the southeast-facing shoreline of Bogue Sound, within the reservation of MCALF Bogue, a facility administered by the U.S. Marine Corps Air Station, Cherry Point, North Carolina. Artifacts previously recovered from the site, which was originally recorded by Littleton and Mattson in 1969, suggested the presence of Early, Middle, and Late Woodland as well as eighteenth-, nineteenth-, and twentieth-century historic occupations. Concern about the continuing impact of military activities and shoreline erosion on these cultural deposits prompted the survey. I served as the principal investigator while Mark Whitby performed crew chief duties. Kay Simpson was the LBA project manager and Richard Kimmel was the Wilmington District representative. Fieldwork was conducted from October 4 through 15, 1993. The survey strategy included mechanical excavation of a series of 30 trenches, 1.7 meters in width by 5 meters in length, to a depth which exposed the surface of culturally sterile subsoil. Trenches were placed in the vicinity of the shoreline, near the tip of the peninsula, as well as away from the apparent shell midden. This approach, based on Mark Mathis' findings at the Broad Reach Site, was intended to identify habitation areas believed to be located beyond the midden area. Mr. Mathis also visited the site during the fieldwork and provided helpful insights on matters relating to artifact types, site patterning, and formation processes. Additionally, shovel tests were excavated in those areas where dense growth restricted machine operation. A pedestrian examination of the shoreline was also conducted. As a result of these activities, 40 features were identified. Lithic and ceramic diagnostic materials recovered indicate the presence of Early, Middle, and Late Woodland components at Shelly Point, although artifact density suggests that the most intensive occupation occurred during the Late Woodland period. A Middle Archaic Morrow Mountain projectile point was also located, which suggests the possibility of the presence of a pre-Woodland component at the site. The paucity of artifacts predating the Woodland period occupation, however, argues against the presence of such a component. One sherd of 19th century historic ceramics was also recovered from the shoreline. An examination of the distribution of ceramics recovered from the site indicates that greater than 60 percent of the small number of Early and Middle Woodland sherds were recovered from the shoreline while only 25 percent of the Late Woodland materials were so located. 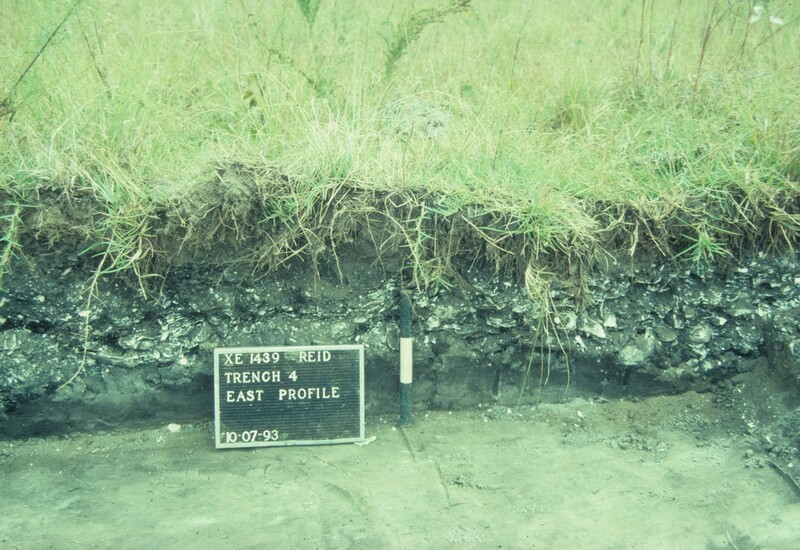 Although inconclusive, this occurrence suggests that the earlier occupations at the site may have been centered near the tip of the peninsula, and been most effected by erosion and sea level rise. No discernable concentrations of artifacts were noted relative to features, inferred structures, or postmolds. Three features were excavated to confirm their cultural origin. The features were basin-shaped pits which contained large amounts of oyster and clam shell and faunal material associated with duck, deer, frog, box turtle, rat, possible dog, unidentified fish, unidentified bird, and unidentified small and medium mammals. Radiocarbon dates of 910 +/- 60 AD (Beta-69589), 1120 +/- 60 AD (Beta-69588), and 1250 +/- 60 AD (Beta-69590) were derived from shell samples taken from the three features. Additionally, several large sherds of shell-tempered, plain surface, Late Woodland White Oak ware were recovered from two of the features. Trench excavation found evidence of intact midden deposits in several areas of the site. Also uncovered as a result of opening the trenches were 274 postmolds, many aligned in linear and rectangular patterns. Several were excavated to confirm their cultural origin. Close examination of the postmold patterns confirmed the presence of at least three prehistoric structures. Based on the data gathered during this investigation, the Shelly Point Site (31CR53) appears to occupy the entire peninsula and, although areas of disturbance were noted, substantial portions of undisturbed midden as well as intact cultural features remain. The site is considered eligible for the National Register of Historic Places. by William H. Reid, Louis Berger & Associates, Inc.